It’s great news for a lot of people who want to keep the length of their hair and gradually cut the relaxed hair as time goes on and as they get new growth. Depending on how long you transition for, it’s important that you take great care of your hair. During the transitioning period, the hair is in a fragile state because of the two textures. The point where the two textures meet is called the line of demarcation and that’s where it breaks often, if not taken care of properly. 1. Use sulfate free shampoos, conditioners, leave-ins, hair moisturizers and always seal with natural oils. Your hair will be easier to manage, look healthy and keep the dryness at bay. 2. Use less heat OR no heat. Heat causes hair to be very weak and breaks easily. Check out this tips on styling hair with no heat here. 3. 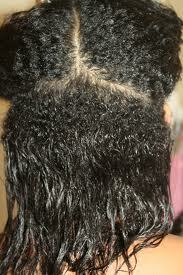 Trim your ends periodically to get rid of the relaxed hair. 4. Always use a wide tooth comb when detangling your hair and you will have less breakage. Always detangle with conditioner in your hair, or while hair is wet, starting with the ends of your hair, working your way towards the roots. Never use a fine tooth comb to detangle. 5. Do a hot oil / deep condition treatment at least once a week to restore moisture and softness to your hair. 6. Wear protective hairstyles. Your hair will have less manipulation and that equals less breakage to your fragile hair. See a few protective hairstyles here. 7. Protect your hair while sleeping. Use a satin headscarf or a satin pillowcase. DO NOT use a cotton headscarf because that will soak up all the moisture from your hair and leave your hair dry. 8. Read the ingredients label on the hair products that you will be using. Some products have harmful ingredients which will damage your natural hair. A few ingredients to stay away from are alcohol and sulfates. These ingredients will dry out your hair. 9. Deep condition your hair for at least 30 minutes once a week after a wash or after you co-wash. This will help your hair to retain it’s moisture. 10. Air drying will be the best option when styling your hair. Constant use of heat on your hair will cause a lot of breakage on your hair. Twist outs, braids outs, bantu knots, coils, buns, box braids,twists, wigs, and weaves are perfect choices. These are great styles because it’s easier to blend the two textures. If you’ll be braiding your hair, don’t make them too tight to protect your hairline and also to allow proper blood circulation in your scalp for hair growth. You can also use tools such as flexi rods, to style your hair. Read about how to go natural (BIG CHOP) and tips for taking care of your hair after you big chop here. Did you transition or are you thinking about it? Share your thoughts with me below.